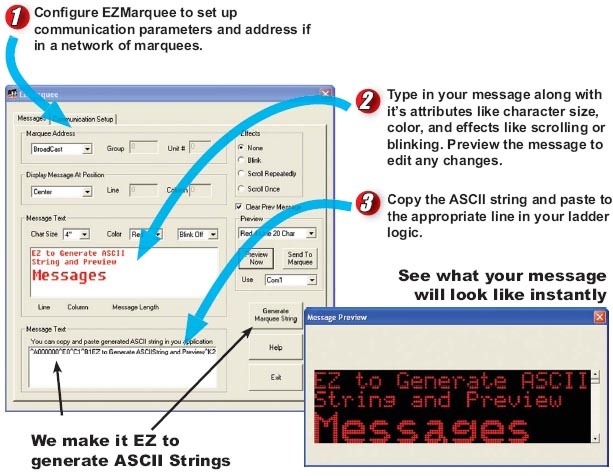 EZ Marquee comes with Free String Generator Software that makes it very EZ to program messages into it. Since the EZ Marquee is a slave marquee that displays messages sent in ASCII format, it is necessary to convert messages written in any language into an ASCII string. For English, we offer a Free software that performs this function literally in seconds. 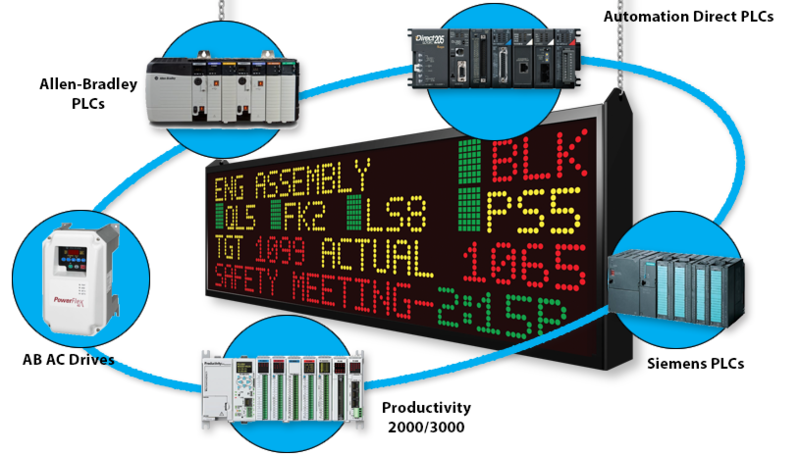 Click here to download the free software, preview messages and generate ASCII strings which can be simply copied and pasted into the PLC ladder logic or in Visual Basic scripting to interface with SCADA packages. This software is also extremely useful when connecting the EZ Marquee simply to your PC. EZ Marquee was designed from the ground up to be SENSIBLE. When designing a marquee, one of the biggest challenges is to manage the power. Even though each LED may need only 10 mA of steady state current or 80-100 mA of peak current, the number of LEDs in even a small marquee is quite large. Most competitive marquees use rather inefficient power supplies and would thus use approximately 200 watts. That is a lot of power which results in a significant increase in internal temperature causing them to design Thermal Overloads or sometimes even Fans to keep the marquee cool. 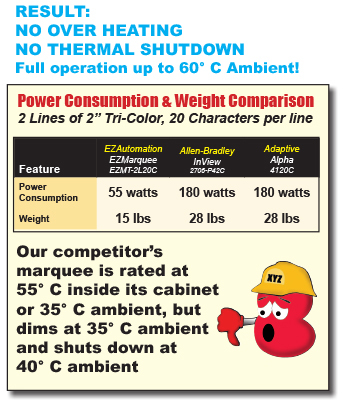 AB’s Inview or Adaptive marquees for example are rated at 55° C but have an automatic dim down at 55° C and an automatic shutdown at 70° C.
Not so with EZ Marquee! With AVG’s innovation and vertical integration strength, we have designed the EZMarquee to consume 1/3rd of typical power and have used a very efﬁcient power switching system (Patent Pending) without sacriﬁcing the LED luminous intensity. This innovative and efﬁcient design automatically results in reducing the weight of EZ Marquee, typically by half of the competitors.